Elastic or expressive timing is a feature of music in ballet classes that I’m rather nostalgic for. When I meet teachers who still do it, I feel as if I’m back home again. Recently, I’ve found that I need a particular category of waltz for company classes with multiple pirouettes, where the tempo needs to be forgiving, accommodating, like stretch fabric jeans that can be a couple of sizes larger than the label suggests. Schmaltzy is what we would have called it a few decades ago, but it’s a long time since I heard that word. When I first started working in ballet, I’d be slightly appalled if a teacher wanted part of an exercise slower than the beginning, to make space for a different kind of step or more pirouettes. Now I enjoy the interaction with the teacher, enjoy the challenge to get the tempo change right and still make it sound musical. You can’t do this with any old waltz, and particularly not with the kind that has an overwhelming metrical level, rather than switching between several through the course of the tune. I’ve put Deutsches Gemüthsleben in the “hearts” section because it has places where it’s in six (see various posts on triple meter), but the opening is very definitely in three. 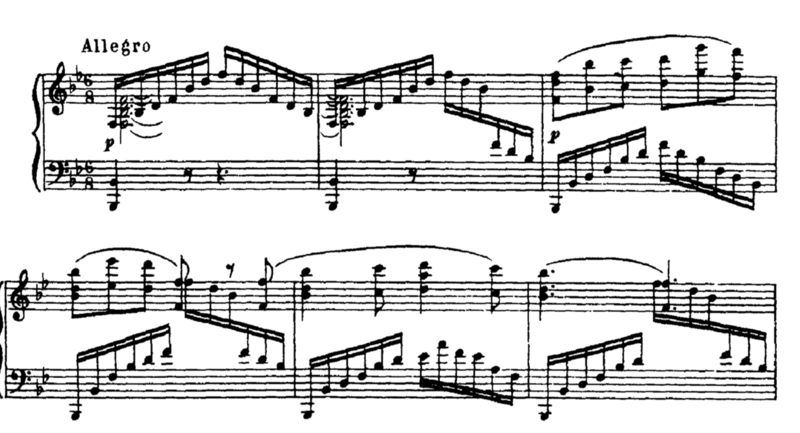 Sections E and F do what the Swan Lake Act 1 waltz does, which is to drive the accent to the second bar and fourth bars. At the ends of sections, the three-in-a-bar is suddenly more marked. In other words, what appears to be simply “3/4” has several different kinds of metre both internally (within a single phrase) and from section to section. I’d never heard of Kéler until I read that he was the source of the Hungarian dance that made Brahms famous when he plagiarized it in its entirety, believing it to be a folk tune (like folk tunes just precipitate in the ether like ectoplasm, huh? ), but I’m glad I found him. See more in Nancy Handrigan’s wonderful thesis On the Hungarian in Brahms, especially pages 55-56, and for the proof, listen to the original Kéler below (scroll to 2:56″ if it doesn’t start there automatically). I haven’t found a performance of this Deutsches Gemüthsleben Walzer that I like, or that does justice to its potential for elastic timing (some of which Kéler writes into the score), but it’s remarkably similar to the waltz in Der Rosenkavalier, which is the feel I’m looking for (see below – scroll to 5:40 if the technology doesn’t make it start there automatically). It might also not escape your notice that both Kéler’s melody and Richard Strauss’s have a lot in common with The Lonely Goatherd from The Sound of Music, and also — i noticed much longer aftewards — with the “Waltz of the Flowers” from The Nutcracker. Perhaps these falling thirds against an unchanging major floor is music’s answer to Gemüt, and perhaps Gemütlichkeit is the best way to describe character of the schmaltzy waltz that you need for a certain kind of pirouette: music that’s warm, roomy, comfortable, supple, supportive, like an armchair by the fire in an old pub. This entry was posted in A Year of Ballet Playing Cards, Music and tagged Dance, Kéler, Music, ballet accompaniment, ballet class, ballet class accompaniment, ballet music, class, waltz on February 11, 2016 10:15 am by Jonathan Still. This is probably the nicest and most useful waltz for grand allegro I’ve found in a long time. It just sounds like ballet. You can use it straight off the shelf, and it’ll work instantly, and I love it. The same goes for the adage from the Talisman pas de deux (my last entry) which I tried out in class today. It sounds just like all the things teachers seem to have in their heads when they mark adages, yet so few pieces actually deliver. It also has within it a brilliant example of the difference between “normal” waltz metre and truly triple metre. The first and last sections are in “normal” waltz metre, i.e. in what we could otherwise notate as 6/8, with a weaker second main beat of the bar, whereas the middle section is truly triple, with accents every three. It’s hard to think of a better example to make the point with. It’s not the cleanest score I’ve produced, but I’m trying out my little Akai LPK25 for the first time, and getting used to using laptop commands (i.e. without a numerical keypad) for a big editing job in Sibelius. It’s hard work, but I’m so glad to have finally done what I’ve been meaning to for years, and buy a little touring keyboard for inputting scores. I remember reading once that Czerny had so many projects on the go that he’d have a room full of desks with a project on each, and go round each one for an hour each, and then move on to the next one. It hasn’t got to that yet, but I found myself rather naturally using one side of the table for PhD work, and the other side for playing work. It makes it so much easier to put things down when I get in. This entry was posted in A Year of Ballet Playing Cards and tagged Talisman, ballet, ballet class, ballet class accompaniment, ballet music, free downlaods, sheet music, waltz on July 16, 2015 5:20 am by Jonathan Still. You can never have enough grand allegro, and this is handy because it’s in a class of pieces that are ballet music, which means that you have to be careful where you play them, but on the other hand, it’s repertoire that’s not often performed, so either people won’t know where it’s from, or they’ll smile and go “Isn’t that…? ?” and you look good because you know weird stuff that you found on Youtube. The solo is at 48’46” in the clip below. It should start there automatically when you click, but if it doesn’t, drag the slider to the correct time. Sheet music for Drigo’s Diane and Acteon pas de deux from Esmeralda, with that fabulous coda, and gutsy male solo, from one of the best ballet music sites on the internet. This is one of the most confusing things in the world of ballet music, since to gala-goers, Diane and Acteon and Esmeralda have nothing to do with each other. The camp girl’s solo by Marenco from Esmeralda pas de deux (not by Pugni, as the sheet music says, but I only know that because the omniscient Adam Lopez told me). This should really be in the Clubs suit, not Hearts, because it’s actually a truly triple meter, not the dodgy six-eight kind—the phrases end on the eighth count, not the seventh. What fooled me was the melodic phrasing, which is in two bar units, which definitely feels duple. But look more closely, and not only are the cadences on 8, but also the harmony changes every bar, which strengthens the case for truly triple metre even more. Also, the introductory vamp before the first jump is one bar long, not two, which aligns somewhat with what William Rothstein has to say about “Franco-Italian hypermeter.” I transcribed this from the recording, so I don’t know whether in fact Drigo did write in 6/8, in which case the single count vamp would align with that theory even more. If it were the case, then the “extra” bar in the middle is not extra at all, because the melody begins on the half-bar in a 6/8 (but don’t try actually playing it that way in class). On the other hand, it could just be a kind of compositional economy: given that you’ve already got an eight-bar phrase of entrance music, you don’t want to prolong the vamp any more than absolutely necessary, so keep it short, if you must have one. Maybe it’s there to provide the dancer with a run-up into the first jump (the vamp-like nature of the music telling the audience that what’s happening isn’t yet dance, just preamble to be ignored. Once you start thinking about Rothstein’s theory (see other posts here and here) it makes something apparently as unimportant as an introduction suddenly fascinating, and it opens up all kinds of possible discussions about metre, grouping, phrasing, accent, and so on. For me, dance makes those questions particularly obvious because you’re dealing with accents and trajectories that happen in time, but they aren’t “musical” in the sense of being tied to time signature or accent. It’s like seeing a landscape compared to an ordnance survey map. This entry was posted in A Year of Ballet Playing Cards, Free sheet music for ballet class and tagged ballet class, ballet class accompaniment, hypermeter, meter, musicology, piano music, sheet music, waltz on May 14, 2015 5:20 am by Jonathan Still. Thanks to Grant Kennedy in Australia for this as an idea for adage/ronds de jambe, anything turgid, anywhere that you need a very slow waltz for ballet class. As it’s from the ballet La Bayadère, you’d want to avoid it for company class if it’s currently in the rep – but as it’s a principal solo, I reckon you could get away with it as long as it’s not a recent memory (especially if it’s in a men’s class). Over the last few years, I’ve become increasingly convinced that ballet classes require just about every kind of triple metre under the sun except what most of us know as a waltz. Polonaise, mazurka, polka mazurka, kujawiak, sarabande, chaconne, redowa, to name those I can remember. But even things that look like waltzes on the surface in ballet often have non-standard features: slow tempo, 8th note rather than quarter note motion, and here’s an odd one: a lean towards the second bar of each two-bar unit, not weight on the first. For the prime example of that, think of the famous Act 1 waltz from Swan Lake – it’s all about the first beat of the second bar, and there’s nothing at all on the first beat of the first bar. I can think of several other examples in the ballet repertoire. (For more on my obsession with triple metre, see earlier post). I reckon that this waltz from La Bayadère is marginal to the waltz repertoire by virtue of its extremely slow tempo. There are, it’s true, several valses lentes in the concert repertoire, but La plus que lente by Debussy is only just a waltz, and not really that slow. The nearest relative of the waltz in today’s “playing card” would be Sibelius’s Valse Triste. But even that has livelier moments. Nikiya’s death waltz is deathly slow, and every darn beat in the bar has weight. This is a bar where you’ll wait forever to get served. And if you’d like to see what they do in the ballet. This entry was posted in A Year of Ballet Playing Cards, Free sheet music for ballet class and tagged ballet class, ballet class accompaniment, piano music, sheet music, waltz on May 7, 2015 9:22 am by Jonathan Still. You’ll probably look at this and think it’s a bit dull. I can live with that, because I know you’re going to thank me one day when you get some really awkward exercise that needs to be like doing a hill-start at traffic lights every bar. As Miss Brodie says of chrysanthemums in The Prime of Miss Jean Brodie “Ah chrysanthemums. Such serviceable flowers.” A withering remark, but nonetheless, if serviceable is what you need, then a polka mazurka (or a bunch of chrysanthemums) is the thing. I’m very glad that I made the distinction from the start in this series between 3s that were really more like 6/8s (hearts) and 3s that are really 3s, because this is a perfect example of truly triple meter, and why polka mazurkas, twee and 19th century as they are, are often much better for pirouette exercises than waltzes. See previous posts on triple metre, and waltzes and mazurkas. I’m making up all the articulations in this transcription, because I have no score to refer to, so I’m just writing down what I can hear. Listen to the recording, because everything about this piece is about articulation and tempo, rather than notes (and that’s why it looks a bit dull on the page). Wurf-bouquet means a “throwing bouquet” (presumably like the one you throw at weddings), and my guess is that there’s some musical gesturing going on in the melody, where the three-note motif (and the way the anacrusis is held back in performance) is meant to represent the preparation and throw of a bouquet. It’s the kind of thing we get used to doing in music all the time if you play for class. I haven’t transcribed the ending of the piece – it goes back to the beginning, and then spends about a minute winding down, which is not much use to anyone in class. There are some interesting similarities between this and the opening of the Grand pas classique in Paquita, which will tell you pretty much for certain that what we have in the ballet is a polka mazurka. That being the case, as lovely as the production below is, I’m guessing it’s probably a bit racier tempo-wise than the original might have been. I could be wrong – one of the useful things Zorn told us was that Russians waltzed faster than most of the rest of Europe at the end of the 19th century, so maybe that applies to the polka mazurka too. The long-short-short-long pattern in some of the bars is identical, and is worth keeping in your tool-box as a means of slowing down waltzes for pirouette exercises. I’m a week behind, as I was at the 2nd Music and Consciousness conference in Oxford last week. Given that other people manage to con prisons into releasing them by setting up email accounts using an illicit mobile phone, you’d think I ought to be able to blog my way through a conference, but I needed a midi keyboard and more time and brains than I had at the end of the day. I’ll catch up soon. This entry was posted in A Year of Ballet Playing Cards, Free sheet music for ballet class and tagged ballet class, ballet class accompaniment, piano music, sheet music, waltz on April 16, 2015 5:20 am by Jonathan Still. Why is the chaconne so rare in ballet class culture? I’ve no idea. Given that ballet’s history is supposed to have its roots in Italy and France, it’s odd that things like minuets, chaconnes, bourrées, sarabandes, gavottes and so on are some of the rarest things ever to be heard in a ballet class. If there’s any cultural hegemony going on, it’s Austro-Hungarian: the waltz and the polka. Of all the music that isn’t played in classes, it’s the chaconne that seems to miss out most. I don’t think there’s a reason why, except that the only kind of three people can think of in a hurry is the waltz and the mazurka, and those rhythms get embedded in the technique, I suppose. Can there really be something about ballet that requires the waltz? Or is it that chaconne requires learning a new rhythmic trick, and ballet habits are remarkably resilient? I discovered a while back that if you’re lucky, and the exercise isn’t too slow, you can replace the thick, porridge-like stir of a waltz played too slow for ronds de jambe with a Chaconne like this (albeit played rather too slow for a chaconne). It has a push on 1, but not the feeling of a wellington boot sinking into mud that the slow waltz has. The dotted rhythms and true triple metre (see earlier posts on the topic of triple meter) keep the music moving. There’s something hypnotic yet interesting about the variations on the ground bass: it’s amazing how much harmonic interest Purcell squeezes out of a single 8-bar bass line. It’s also handy that there’s loads of it – 16 eight-bar phrases. I’ve put rehearsal marks on each one so you can pick and choose depending on the length of the exercise, but beware of H – it’s the only time the phrase ends in a dominant. There are some great recordings available, but I chose the one below because it has some baroque dance in it as well – which helps to give an idea of what a central tempo for this could be, even though it bears playing more slowly. By chance, I started to input this just before going to a wonderful concert of the Shostakovich 1st violin concerto at the Barbican, and I was thinking of how the first of Shostakovich’s 24 preludes and fugues is a little chaconne, rather like the one in Purcell’s The Fairy Queen. Then In the violin concerto there’s also a kind of chaconne-like passacaglia in 3, which I felt peculiarly prepared for, as if inputting the Purcell had been a kind of mental warm-up. On wikipedia there’s a wonderful list of other compositions that have used the chaconne as a basis. Well worth looking at for other ideas, if you liked this one. This entry was posted in A Year of Ballet Playing Cards, Free sheet music for ballet class and tagged Dance, Purcell, ballet, ballet accompaniment, ballet class, ballet class accompaniment, ballet music, chaconne, class, free downloads, sheet music, waltz on April 9, 2015 9:06 am by Jonathan Still. It’s well known that Stravinsky borrowed tunes from Lanner for the ballerina in Petrushka. I knew about the Schönbrunner waltz Op. 200 [link to score], but I was pleased to find the other tune on page two of the Steyrische Tänze Op. 165 [link to score]. This is why I love IMSLP – it gives you a chance to recover sources like this. I can remember reading a book or programme note about Petrushka that said in a supercilious tone Stravinsky was caricaturing the facile melodies of Lanner’s waltzes, and in a sentence like that, Lanner gets pushed further to the bottom of the heap of composers that one is not supposed to like, or even look at – you can just rely on some secondary source to tell you what to think. I’m not saying that when you look at it again, you realise that Lanner was a master composer and this is a wonderful piece – but I do like to have the opportunity to hear this music without the modernist composer’s, musicologist’s or critic’s sneer all over it (hear it for yourself here.) It opens with a waltz in 3 bar phrases (like the Glinka Valse Fantaisie), and is really rather nice. The only reason I found it was because I’ve realised that the Steyrische (or “Styrian”) has got just the right degree of turgidness for a certain kind of ronds de jambe exercise, so I was hunting around IMSLP to see if there were any good ones to add to the repertoire. I’ve played the Schönbrunner waltz several times in class, and no-one’s ever said “That’s Petrushka!” so I wonder if they’d notice if you played this. Of course, if they did, the nice thing is that they’d think you were playing Stravinsky, so you could put on your Stravinsky face and make out that it was really hard. I’ve also played “Po dikim stepyam Zabaikalya” which is also quoted in Petrushka, and no-one’s ever noticed either the folk song or thought it was from Petrushka (they’ve not noticed the other folk tune – Я вечор млада во пиру была – that I play sometimes, either). This entry was posted in Music and tagged Lanner, Stravinsky, ballet music, borrowings, popular music, sheet music, waltz on April 6, 2015 9:03 am by Jonathan Still.